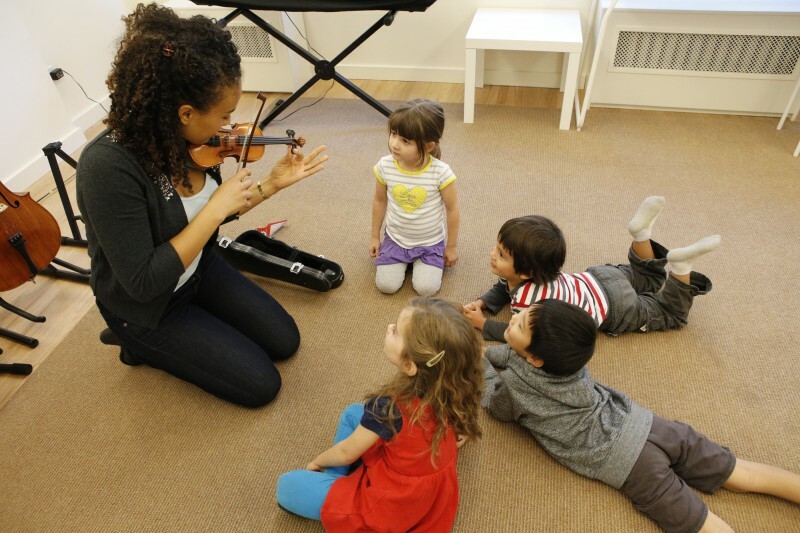 You are here: Home / Our Programs / Introductory Music / Ready, Set, Play! CLICK HERE to learn about Ready, Set, Play! class in Spanish! Our Ready, Set, Play! 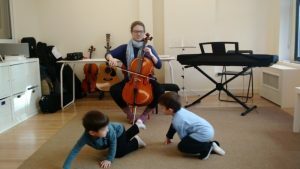 classes for children from 2 to 6 years (and now 6-10 year olds too!) 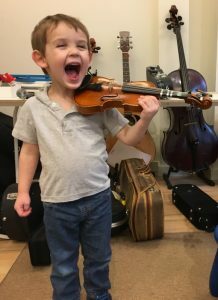 are designed to introduce the violin, viola, cello, guitar, flute, and piano in addition to other elements of music study; students play percussion instruments, listen and move to live music, read and write rhythms, and sing. Repetition of songs and activities from week to week allow children to gain confidence as they achieve comfort and mastery of musical skills. These classes encourage and prepare young children for instrumental study in a fun, relaxed, and supportive environment. Classes meet weekly for 45 minute with 3 – 6 students per class and one or two teachers. Children learn to accept instruction from the teacher in small doses while also given freedom to express themselves with the instruments. 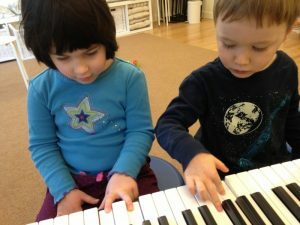 Each child has one-on-one time with the teacher and the instruments, as well as experiences making music with the group. Note values and the reading and writing of rhythms are introduced. Children proudly compose their own short rhythmic pieces and learn to play them on the piano and rhythm instruments. As students grow and mature, Ready, Set,Play! 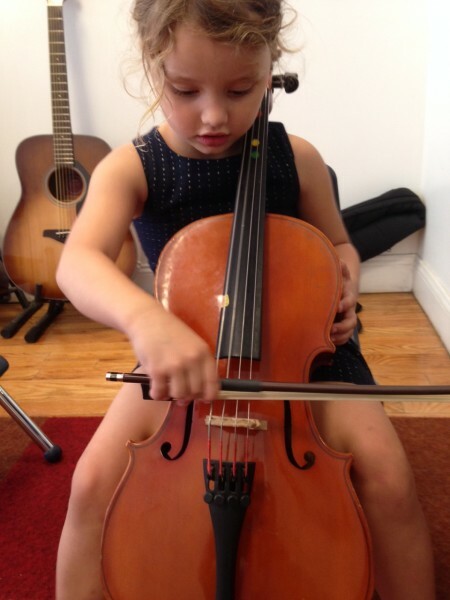 classes grow and develop with your child. Parts of the class model the quiet learning environment of a private lesson where children learn to take turns, follow directions, and be attentive with the comfort of their parent or caregiver close-by. 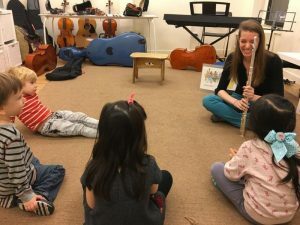 Most of our students participate in RSP classes for multiple semesters or years, allowing them to grow in self-confidence and enthusiasm for music while working on developing the focus necessary for private study. Our teachers are adept at supporting and challenging students at every level in our very small classes, allowing mixed-age and mixed-level classes to be successful and motivating for all of the children. 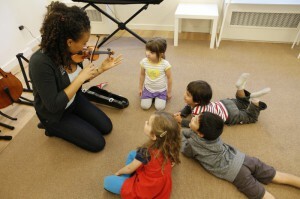 In a typical class, children may sing the Rest Position Song with violins under their arms and take a bow, play along the Twinkle Variations or Vivaldi’s Four Seasons with rhythm sticks, play an improvisatory piece on a group of drums, pluck the String Song on small cellos, move to the rhythmic elements of “beat”, “running”, and “half”, practice flute “sign language”, and find patterns and sing note names on the piano. We invite you to observe a class and meet briefly with one of our class teachers, or come to a Demo class. We would love to meet your child to help place him/her in an appropriate class!